[LATEST HDMI STANDARDS] 4K@60Hz, 1080p@60Hz, 3D, Deep Color, HDCP pass-through, uncompressed and compressed audio formats are all supported. [2 INPUT 1 OUTPUT] Easily switch between two HDMI video sources to one HDMI display. [POWERED BY HDMI SOURCE] No adapter needed; plug and play functionality. [LIMITED LIFETIME WARRANTY] This Fosmon product includes a limited lifetime warranty. Please visit our Fosmon website for more details. 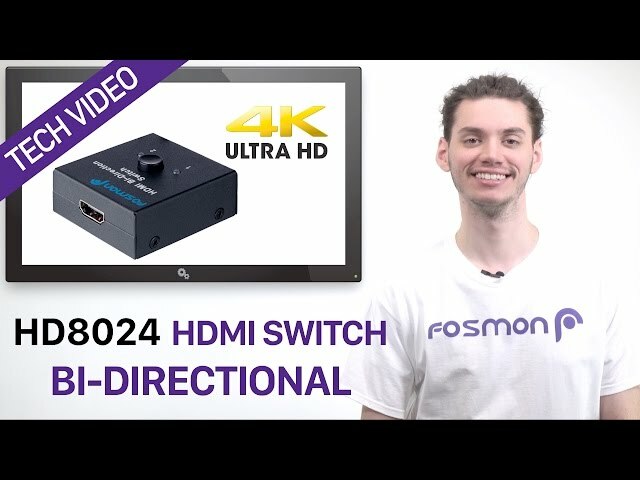 Fosmon HDMI Switch with Bi-Directional function and HDCP Passthrough allows you to connect two high-definition HDMI sources like Blu-ray or PS4 to a single HDMI display. It also allows you to output single high-definition source to two displays. Up to 4K resolutions at 60fps, 32-bit Deep Color, 3D, and uncompressed/compressed audio formats are some of the newer HDMI features supported on this switch. No power adapter is necessary for this switch to function, as long as the connected devices supply sufficient power through the HDMI cable.